Mixed Nuts — An Evening of Song and Schtick — will be presented Saturday night in tribute to late Red Deer thespian Carole Forhan. Featuring more than 30 performers, songs from 10 Broadway musicals, and a series of comic scenes, the one-night presentation at Studio A of the Red Deer College Arts Centre will be “a celebration of laughter and song — which is what Carole would have loved,” said the revue’s director Lori Lane. Forhan, who died of cancer in October 2016, was a U.K.-native who came to Red Deer via Quebec, Saskatchewan and Drumheller — getting enthusiastically involved with theatre groups wherever she went. This spring, the Red Deer Players will be presenting the first annual $500 Carole Forhan Theatre Arts Scholarship to a deserving individual between 14- and 21-years-old who’s interested in expanding his/her theatre training. Lane said the Mixed Nuts revue is helping kick off the memorial scholarship “with a bit of fanfare,” raising public awareness of the award as well as its namesake. Forhan was a member of Red Deer Players and Central Alberta Theatre, who lent a hand wherever needed, said Lane — whether as an actor, director, costume sewer or set painter. “She was always the last to leave and the first to arrive,” tackling everything — including making experimental prop “bottles” out of sugar so they could be broken without causing injury. Lane recalled Forhan was particularly thrilled to work with youths, so was touched to learn a scholarship benefitting young people would be started in her name. An endowment was raised during a special gala performance of Calendar Girls. Applications for the scholarship will be accepted on the Red Deer Players website until April 15 and the money will be awarded in June. Lane said many talented people are involved with Mixed Nuts, including Paul Boultbee, Keith Ainscough, Nigel Lane and Haeley Ginter. Blaine Newton and Leslie Greentree will return to Red Deer from Edmonton to take part in the presentation. Tunes from Phantom of the Opera, Oklahoma, Wicked and Spamalot will be among those performed. As well, students from Notre Dame High School and St. Joseph High School will reprise music from their school productions of Do You Wanna Dance? and Godspell. About half of the eight comic scenes tare written by Newton and the others are by British performers Rowan Atkinson, Dudley Moore and others. Lane believes Mixed Nuts will be an musical evening of theatrical fun that honours a woman who left a positive mark on her community. Tickets are available from rdc.ab.ca/tickets or through www.reddeerplayers.com. For an evening packed with ‘song and schtick’, check out Mixed Nuts on March 23rd, hosted by the Red Deer Players. The fun kicks off at 7:30 p.m. in Studio A at Red Deer College. Tickets are available at rdctickets.universitytickets.com and www.reddeerplayers.com. 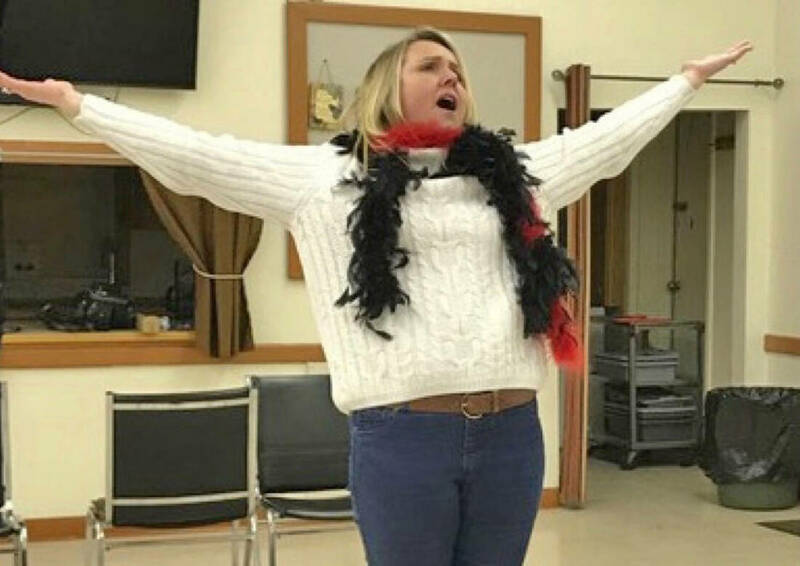 Besides offering up plenty of engaging skits and Broadway-style musical entertainment from a very talented troupe of local performers, the event is also meant to launch the Carole Forhan Theatre Arts Scholarship. Forhan, who was a beloved supporter of the local arts scene and was one of the founders of Red Deer Players, passed away in 2016. “We wanted to celebrate the fact that the Scholarship is now open for business,” explained Lori Lane, a member of the Players who has also directed some of the troupe’s most powerful shows including Mass Appeal, Twelve Angry Men and Calendar Girls. The team also wanted to present an evening packed with entertainment which seemed like the ideal means of spreading the word about the Scholarship as well. “We struck a committee of Red Deer Players members who all knew and loved Carole, so doing something really special to launch the Scholarship was important to them,” she said. “So that group got together and started brainstorming about what this evening could look like,” she said. From there, they felt that they wanted to include some local young people in the show as well, as the Scholarship is of course geared to the younger set. “We thought, wouldn’t it be great if we had a whole slew of 14 to 21-year-olds in the show? Notre Dame students will be performing a part from their recent show Do You Want to Dance? Students from St. Joseph’s will be showcasing scenes from Godspell, which they bring to the stage this week. “In addition to them, there are 11 of our own cast members in the show. There are eight comedy pieces in it – some are written by Blaine Newton but others are really tried and true, zany British comedy pieces,” she said, pointing out how fitting that is as Forhan was originally from England. “The skits are threaded together by the songs I’ve chosen, and there are 10 different Broadway musicals represented,” said Lane, who is also directing Mixed Nuts. Hosted by Leslie Greentree, the show features Trish Achtymichuk, Keith Ainscough, Paul Boultbee, Jennifer Cocolicchio, Haeley Ginter, Nigel Lane, Caryl Moore, Blaine Newton, Wanda Oler, Lesley Parfett, Randall Trites and Gracie Wack. Louise Bruns is serving as musical director with Debbie Thompson as the choreographer. Looking ahead, the Carole Forhan Theatre Arts Scholarship will be available on an annual basis, in the amount of $500, awarded to an individual who demonstrates passion, dedication, a solid work ethic and commitment to theatre, and who is moving ahead to further their education and/or knowledge in the area of theatre arts, notes the web site. ​Again, for more about Red Deer Players or the Carole Forhan Theatre Arts Scholarship, check out www.reddeerplayers.com.